Scrub and I have decided to go to church “out on the prairie” which is where my parents always went to church. If we go we might run into some of our cousins and maybe our aunt and uncle, my father’s brother and his wife. We don’t have time to go visiting relatives this trip. We are only here for two days and our mother is our priority. 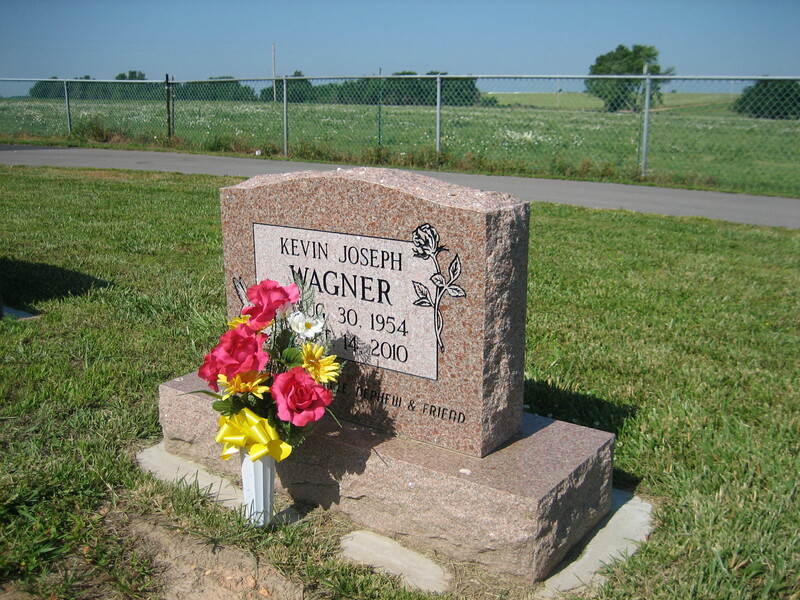 I also want to see Kevin’s grave because I haven’t been back since he died and I didn’t see his headstone, which I designed. I want to visit my father’s grave as well. We think Mass is at ten, but when we arrive no one is there and we realize it’s at ten-thirty. It doesn’t matter, though, because we’ll just visit the cemetery before Mass instead of after. 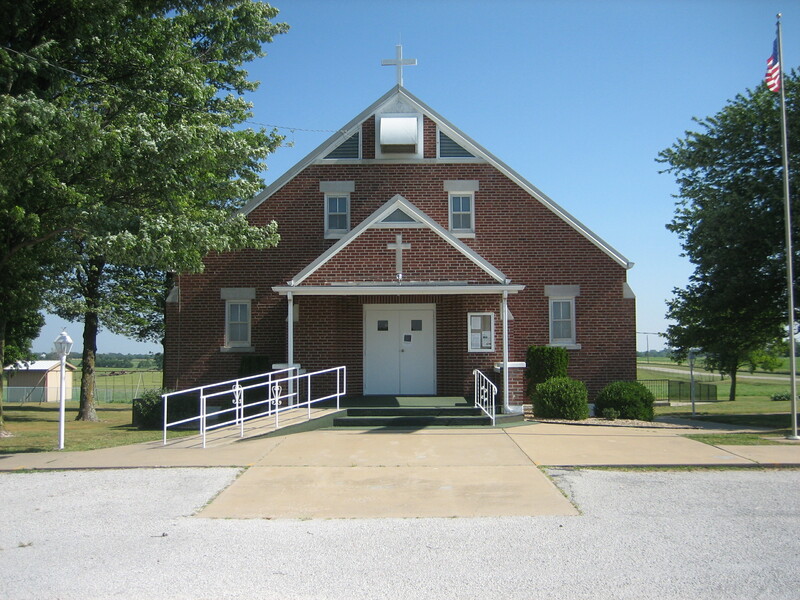 St.Agnes Parish is on a country road surrounded by farmland and pasture. I take a picture of the church. It’s been there forever. My father used to tell the story of how it burned down and how he and his father and brothers and the surrounding neighbors helped rebuild it when he was a child. The cemetery is where my grandparents are buried. Generations of relatives, my father and brother are buried there as well. We find my parents’ headstone which only awaits the date of my mother’s death and another funeral to be complete. I take a picture and think of my father. Sometimes I still miss him but I’m glad he’s not in pain any more the way he was there at the end. Kevin is buried in a newer section of the cemetery they were expanding when he died. There are only three graves there. His headstone looks good and is a good representation of who he was. There’s a rose curling up one side and a hummingbird on the other. Beneath his name and the dates of his birth and death are the words, “Son, brother, uncle, nephew, friend.” I take a picture. The cemetery is the most peaceful place I’ve ever been to. The wind blows across the prairie. That’s the only sound you can hear. Just beyond the fence is pasture. In the distance cows are grazing. Looking back up the slope are a thousand graves and stones and beyond that the simple church. There’s something about this place. It’s like time stood still. The people who worship here now, worshipped here as children. So did their parents and grandparents. The church doesn’t change. Only the cemetery grows larger. 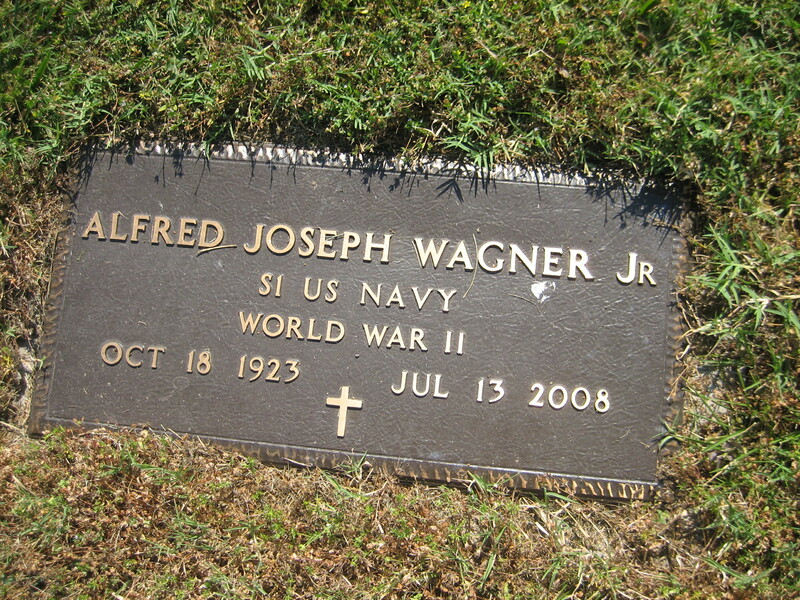 I stop back by my father’s grave and notice the plaque commemorating his service in the Navy during World War II. It is set into the ground and crabgrass has begun to grow over the edges. I stoop and pull up the intruding grass and toss it away. We head back to the truck and notice other arrivals. Pretty soon my aunt and uncle drive in and park next to us. They are accompanied by their son, our cousin Ken, and my aunt’s brother. They are surprised to see us because we didn’t tell anyone except our aunt Maxine that we were coming this weekend. Ken is visiting from his home nearKansas City. We chat for a bit and then head into the church. Our cousin Cheryl and her husband catch us to say hello as we are walking in. Sitting behind us is another aunt’s sister who was also married to my father’s best friend. Eddie died years before my father. I am not related to this woman but I know her and turn around to say hello and remind her who I am. She asks about my mother. We are sitting behind my aunt and uncle and he turns around to ask if we can come back to the house after church. We can’t because we are going to pick up Mom and bring her to Maxine’s house for a get together with our other two aunts on her side. This trip is all about Mom. My uncle Clem is my dad’s younger brother and I’ve always enjoyed his company. He is incredibly clever and funny. He loved my dad and did what he could for him when he was sick. His wife Lenore is lovely and caring. She raised four boys while working on the farm. She’d drive a tractor and she always had a tan. At her age now, all those days in the sun show in her face. My uncle has two nicknames for her. Lard and Chub. She’s tiny. She might weigh a hundred pounds. After church we drive toCarthage. Gas is $3.23 here, the cheapest I’ve seen it and more than forty cents cheaper a gallon than it is inFlorida. We fill up and stop so Scrub can get a carton of cigarettes at Mazoo’s. We arrive to pick up Mom who is once again waiting for us. We tell her we are going to Maxine’s and she decides that will be all right. She’s not too sure of who we are, even after we tell her. She seems then to know who Steve is but she’s not at all sure who I am. We get in the truck, a feat that is a bit difficult for her as she has to step up into the cab and Steve always has to remind her to take hold of the handhold inside the door. Once we’re on our way she tells us she had a wonderful husband and four children. She talks to us like one would a guest or someone she’s just met. She tells us things as if she’s making polite conversation with strangers. She has figured out who Steve is and then she turns to me and says, “And what was your name again?” Barbara I say. Oh, that should be easy to remember. One of my children is named Barbara.” Really? I say. Yes, she says. “Barbara Anne. What’s your middle name?” Anne, I say. Really? she says. Yes, I say. Quite a coincidence, isn’t it? I can hear Steve chuckling on the other side of her. Every time I talk to her I turn to her so my mouth is next to her ear and I speak loudly so she can hear me. Every time Steve says something to her she says, “What?” So I have to turn to her and speak loudly and repeat whatever he says. This is how the twenty-minute drive to my aunt’s house proceeds. We arrive and my mother seems to know who Maxine is. She may or may not recognize and connect who my other two aunts are. They were married to her brothers. She greets them, though, and says it’s nice to see them and asks how they are. She tries to help get the meal on the table, but I think my aunt is afraid to let her carry a glass or a bowl. Plus there are plenty of hands, so we get settled at the table quickly. Martha says a blessing and we start eating. My mother is quiet. Maxine has asked her if she wants some of everything as it come around. Tomatoes? 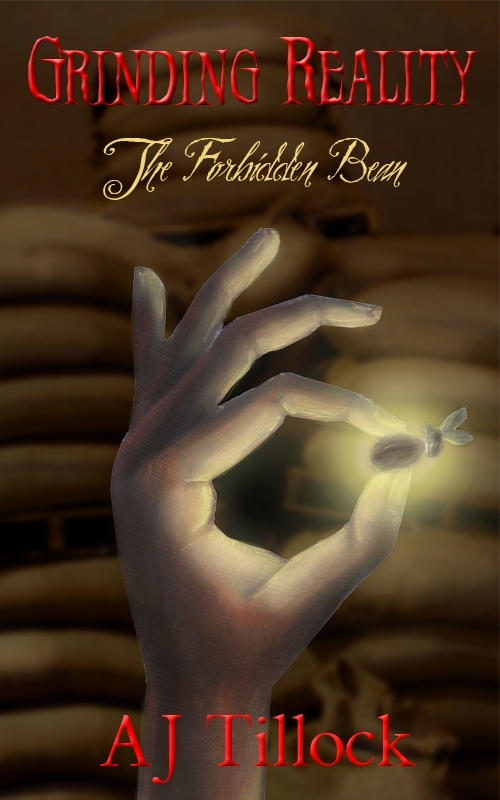 Green beans? Potatoes? I’ve put a chicken breast on her plate. We catch up with our aunts and much of the conversation I’m sure Mom can’t hear anyway and wouldn’t remember if she did. My cousin Louella and her husband William are expected later that day. They live inSt. Louisbut they visit a few times a year and stay with Maxine. Maxine has made a cherry pie and Martha has brought a peach pie. I have a small slice of each. The cherry pie is just about the best thing I’ve ever eaten. Maxine is an excellent baker and her pies are fantastic. The crust is flaky enough to be worthy of a pastry chef’s license. I’d eat more but don’t want to make a pig of myself. My aunt questions how long it’s been since I’ve been here. Two years? Yes, not since Kevin’s funeral, I admit. I’m up for the Bad Daughter of the Year award. I think I might just win. barbara meyers, family therapy, Missouri, travel. Bookmark.